Finnish crochet designer Molla Mills launched her first book, Virkkuri 1, in 2013. An English version of the book, titled Modern Crochet, was released in the UK and US shortly thereafter. She continued working on her designs and a second English release, called Crochetterie, followed. Through these two crochet books you can see more than 60 crochet patterns that reflect the contemporary chic style of Finland. Molla's books in Finnish are called Virkkuri (which means crochet). The English title for Virkkuri 1 is Modern Crochet. This book is a strikingly beautiful hardcover title with a terrific contemporary design aesthetic. If you like the Scandinavian style, then it will immediately be appealing. This book has plenty of clear instructions and more than two dozen amazing projects. 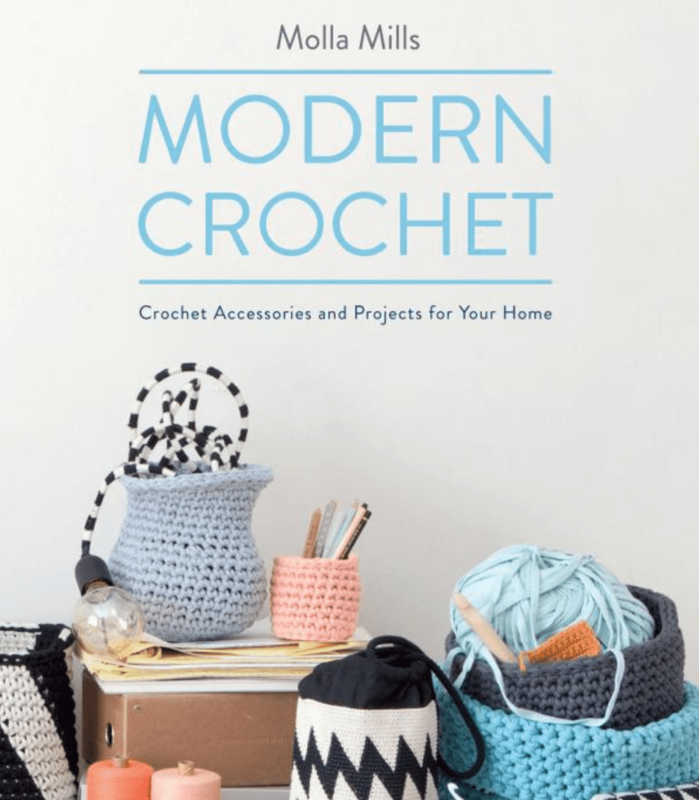 Modern Crochet starts off with a 30-page section of basic instructions that will show you everything that you need to know about how to crochet for the projects in the rest of the books. People who are beginners to the craft will find it easy to learn everything that you need to know about crochet from this single title. This book covers the basics, but it also goes into detail about advanced techniques. It covers changing colors in the middle of the row, two kinds of yarn changing options, working with zippers, and sewing seams. After the section that teaches you how to crochet, the book delves into the projects. This is where you really get to see the beauty of Finnish design. There are projects for the home, including baskets, vases, cushions, rugs and a lampshade. There are also crochet patterns for jewelry, purses and cozies for your electronics. This means that you can incorporate Scandinavian crochet into your personal fashion style or into your home decor. This book finishes with an entire section on learning how to design and crochet your own "pixel pattern". This is a version of filet crochet. It is perfect for creating graphic designs, and it's not something that you're likely to see in most beginner crochet books. This makes Modern Crochet a comprehensive title with a little bit more than most books. Molla Mills' second book hasn't been translated into English, but it has beautiful detailed photos that make it a terrific coffee table book. People who love crochet, design and books as art objects will love this title. Something special about this book is that at the end of it Molla has included a section of stretching and yoga poses for crocheters. It's such a unique addition to the book and one that seems so important. Crochet solves a lot of health problems but it can also cause a few if you aren't careful so it's important to take care of yourself when crafting! The fact that she has included this not only speaks to her thoughtfulness as an author but also makes it obvious that Molla spends a lot of time crocheting. For those who do read Finnish patterns, those in this book are no less impressive than the patterns in Modern Crochet. The designs include nesting baskets, handled tote bags and crochet buckets, a matching cushion and rug set, and various purses. There are lots of solid colors, simple stripes and blocky geometric patterns, which is true in Modern Crochet as well. The designs have the best of simple Scandinavian style in terms of both shape and color. "Molla Mills is a girl with crocheting hooks instead of fingers, hands working all the time. Crocheting in a bus stop, in a shop queue, in a bar, in a lecture, Molla uses more kilos of yarn in a week than she consumes chocolate, and chocolate is her weakness." It almost seems as though she never stops crocheting. She kept coming up with fresh new Scandinavian crochet patterns, and she keeps putting out new books. Virkkuri 3 became Crochetterie when it was released in English. Like her other books, it includes items for the home as well as wearables. There is also a specific section for travel, with unique patterns like a passport bag and a can carrier. With this book, Molla wanted to reach out to male crocheters, encouraging them to learn the craft and to create things that they themselves might like. She mentions her grandfather in the design notes for the Log Carrier, which, as the name suggests, is a tote designed to carry firewood in from the cold. Although we still see color in these patterns, there are more neutral designs, with an emphasis on graphic shapes. This book also shows the crafter how to combine materials with crochet. In one case, a crochet men's sweater is adorned with a fabric pocket. Alternatively, there is a crochet pocket for a regular t-shirt. We see many fresh new ways to use crochet while still sticking to the Finnish design ethic.